Why is the public not allowed to ski on the lake without being a member of LKWSZ? d) Passes a visual inspection by an approved LKWSZ Safety Officer. For more information on the requirements for membership, see our Information Sheet which provides a list of all LKWSZ requirements. $200 Joining fee. $350 Annual fee. These fees are subject to change annually. What are the permitted times for skiing? Boats are not to be operated after sunset. The number of concurrent boats using the lake must not exceed the maximum number depending on the water level (see below). The hours are shorter than most lakes in southeast Qld as there are many residents surrounding the lake and we take their privacy and serenity very seriously. g) If your boat meets the above criteria it will then be visually inspected by a nominated Safety Officer. I don’t own a boat. How can I ski on the lake? If you don’t own a boat, you can still ski with one of the members. Simply email info.lkwsz@gmail.com and let us know that you are keen for a ski. We will then let our members know and they can get in touch. Alternatively, come to one of the Public Come and Try Days that are held every quarter. See below for more details. Can I ski while I am waiting to become a member? Absolutely, but unfortunately not with your own boat. However, we always welcome non-members to ski with our members. Simply email info.lkwsz@gmail.com and let us know that you are keen for a ski. We will then let our members know and they can get in touch. Alternatively, come to one of the Public Come and Try Days that are held every quarter. See below for more details. Who owns and manages the lake? Seqwater own the lake and skiing is managed by LKWSZ. Prior to Seqwater it was owned by the Pine Rivers Shire Council. LKWSZ is a not for profit organisation run by volunteers. It is managed to the best of our ability and within the restrictions placed upon us. Pine Rivers Shire Council imposed a membership cap of 70 boats and this has continued when Seqwater took over the lake. Recent changes made by Seqwater has resulted in the membership cap being lifted to 90. How many boats are allowed on the lake at any one time? Why is there a slot cut in the spillway? Every dam wall requires some maintenance during its life. It was found that the earth wall beside the spillway required repairs and engineers needed to act. To remove the load from the wall, a 2m wide slot was cut in the concrete spillway to effectively and temporarily lower the water level. The bottom of the slot keeps the level at 60% (100% is the top of the spillway). Seqwater Dam Levels note that the bottom of the slot is the new temporary 100% level. When will the lake be back to 100% water capacity? 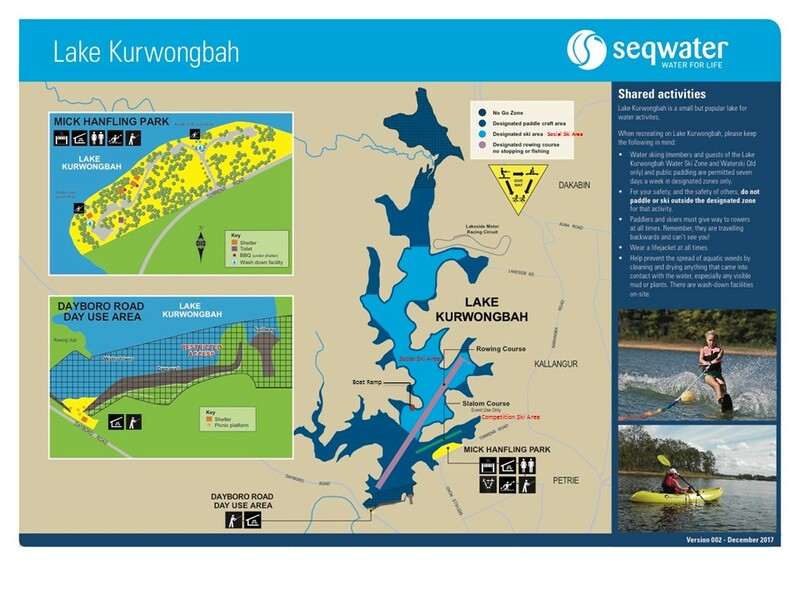 In 2018-19, Seqwater will be upgrading Lake Kurwongbah (Sideling Creek Dam) as part of the Dam Improvement Program. Expected completion is approximately 2020. Where is the Competition Ski Area? Where is the Social Ski Area? The social ski area runs north of the competition area up towards Lakeside Raceway. Through the centre of the lake it is approximately 3km long. Why do I rarely see skiers from Mick Hanfling Park? Only the competition area (and a very small section of the social area) is visible from Mick Hanfling Park. You will only see boats in this area when there is a competition or when skiers are using the slalom course for competitive or social training. This area is limited to one boat only in the slalom course. There can be other boats waiting stationary outside of the slalom course. The course is used on a set for set rotation. Where is the boat ramp? In the early beginnings of the ski club, 8 (one lane) ramps were constructed and scattered around the lake. Currently, only 1 ramp is used, and it is located at the Ski Road Parklands within the licenced area on the southern facing bank. The other 7 ramps are no longer used because they are not close to the wash down station or within the area that LKWSZ is permitted to use under its licence agreement with Seqwater. What is the wash down station? The lake is infested with highly spreadable Cabomba Weed. This aquatic plant was originally intended for use in fish tanks but made its way into the lake. Seqwater and LKWSZ manage the spread of weed by use of high pressure water which keeps the weed on site. Washing boats and trailers is very important. Seqwater constantly monitor usage of the wash down station and keep the system operational. Where and when are club meetings held? Meetings are held on every second Wednesday of the month (excluding January) from 8pm at the Pine Rivers Rowing Clubhouse, Dayboro Road, Kurwongbah. Does LKWSZ run any events? The club run many events each year, most of which the public are encouraged to attend. Charity Ski Days. A free day of skiing to our nominated charities and their families/caregivers. Public Come and Try Days. We hold quarterly Public Come and Try Days. These days are an opportunity for the public to come and ski behind our members boats.To see when the next Public Come and Try Day is, see our Events page. Social Time Trials. It is all about endurance and how well you can keep time, not speed. Teams are given a lap running order which shows the specific time given for each lap and the type of equipment that both skiers must use. Teams ski around a set course starting at approx. 90 second intervals. For every second early or late of the specific lap time accrues a demerit point. Team with the least points WINS! Great event for all the family no matter what age or skill level. What are the Charity Ski Days? For over 20 years LKWSZ has run this event bi-annually. They are purposely designed to help disadvantaged, disabled and sick children and adults, including their families and/or caregivers. We support Make-A-Wish Foundation, Sporting Wheelies and Mates 4 Mates. The event is free. We take care of everything and put on a BBQ lunch. Does LKWSZ have any additional rules? Maximum of 4 adults (or children equivalent) and 1 child in the boat whilst towing skiers. Maximum of 3 skiers towed. Boat must not be over its capacity rating (including skiers). Boats to travel in an anti-clockwise direction. No person to be seated forward of the driver at any time (e.g. bowrider). Boat must be washed down thoroughly at the washdown station before leaving the parkland. Lake Kurwongbah was originally built to supply water for paper manufacturing at the Petrie Paper Mill (now demolished and the future site for the University of Sunshine Coast). Situated on Sideling Creek, with excess water flowing into the North Pine River. LKWSZ was established in 1959. Lake Kurwongbah has hosted many world, national, state and local tournaments. The lake has been a training site for many Aussie champions including world champion jump skier Geoff Carrington and ten times Australian waterski champion Mark Beretta. Full capacity of the lake is 14,370ML. At it’s current reduced capacity, the lake is 10 times smaller than Lake Moogerah (83,765ML) and 44 times smaller than Lake Somerset (379,849ML). (Lake Somerset 42.1km2 and 1,330km2). The lake is the only ski lake in southeast QLD in the heart of a residential area. The road leading into the lake is aptly named Ski Road because of the lake’s approval to be used for water skiing (and rowing).